Earlier I’d tried by phone, but the results were even less satisfactory. At least here I was getting to look at fortune cookies, and though as a herd they all look alike, as individual confections it’s possible to discern specifics in each. My goal, however, was not to start a fortune cookie mug-book, but to find its genesis. Wandering north along Stockton Street, I realized I was about to run out of Chinatown to search through, and felt at a loss as to where to continue my search. Then, within sight of Little City Meat Market and the delis constituting the informal demarcation line between Chinese and Italian North beach, I saw a glowing neon fortune cookie in a window with an on-site production sign. Not believing my luck, I entered, feeling like Galahad responding to a “Holy Grail Nightclub” marquee in the middle of nowhere. An elderly Chinese woman asked me what I wanted, but my questions couldn’t make it over the language barrier. Finally, she told me I’d have to talk to “Simon,” who would be there sometime after nine the next morning. Having about eighteen hours to kill before the Fortune Cookie Summit Meeting, I decided that background work into the whole affair of fortunes and auguries was in order. Western fascination with the unknown traces its occult roots directly back to Assyrian and Canaanite influences on Italo-Etruscan civilization. The Etruscans had their own version of fortune cookie divination, called “haruspication,” the reading of livers to foresee the future. When the Romans took over Etruria, they assimilated the Etruscans’ fascination with auguries and it’s been a fortune telling straight shot from them to us. Ancient Chinese auguries involved the inscription of enigmatic verses on animal shoulder bones and tortoise shells, which were roasted until they cracked. Heat fractures running through the script were interpreted by augurs consulting esoteric texts pertaining to the cosmic interplay between yin and yang and what it all means...which brings us back to fortune cookies. The next morning I’m back at Mee Mee Bakery and meet Simon Chow, a friendly, slender, middle-aged man who puts aside his mid-morning bowl of noodles to give me the fortune cookie skinny. Mee Mee is the oldest fortune cookie company in San Francisco, moving to its present location “from just up the street, many years ago.” When you enter the store there are old pictures of the original machines and men twisting cookies into shape by hand. The entire process is now automated, the old machines being “retired with great respect after working very hard.” Mee Mee’s now runs four machines, each baking twenty cookies a minute, which comes to about 40,000 cookies every eight-hour shift. The store windows are crowded with plastic bags containing regular, chocolate, or strawberry cookies, with prices starting at $3.60 a pound. Mee Mee’s is also home to the “Giant Fortune Cookie,” six inches in diameter and costing $7.90 for regular or $20 for custom. Getting down to basics, I ask Simon where fortune cookies originated. “San Francisco, of course... though some people say L.A... but that’s not true.” And the fortunes themselves? Who writes them? The fortunes have been around as long as the bakery, and according to Simon they’ve been coming from the same source since day one. The bakery can provide custom messages, up to thirty-two characters, and it’s not unusual for businesses to order cookies with ads inside. I’m still talking theory when Simon asks if I’d like a tour. Once past the crowded front counters, we work our way through a narrow path crowded with machinery and flour sacks. Once I see the machines, it’s obvious why most other bakeries outsource their fortune cookies. They’re huge. Four of them take up an enormous amount of floor space. Cast iron and chrome, they stand about five feet high and cover about 50 square feet. The dough, consisting of flour, sugar, butter, sesame seeds, and a bit of egg-shell coloring, gets pumped into the cookie machine from large plastic buckets and pours onto what look like two-inch-wide Belgian waffle irons on a metal conveyer belt. Once the little bake pans are tripped shut, the belts pull them into a round, flat, closed-top oven to cook for three to four minutes at 500 degrees. When the pans come out the other side, the tops automatically flip open and the cookies fall into wire racks moving toward a lever which pushes the paper fortunes out of a chute onto the center of each cookie. From there the warm, pliable cookie is conveyed onto a folding apparatus which bends it into its familiar shape. Finally, the cookie rolls to the end of the conveyer belt and falls into a plastic barrel, ready for packaging. The baking area is very hot, and even with fans blowing the three men tending the machines have lobster-red faces, though they all go out of their way to nod or say hello. A two-man crew is wrestling flour into a squat, heavy, white enamel dough machine, which Simon informs me first saw duty in the galley of a battleship during World War II. From what I can see, it has plenty of fight left in it. As I leave, Simon hands me his card and a bag of cookies, telling me to let him know if any more questions come up. I thank him, saying I’ll be back for more cookies. The morning fog has burned off so I put on my sunglasses and crack open a cookie: “Beauty, like truth, is all around you.” Pondering the fortune, I crunch away. Sure beats reading livers. Walter Lenci & Michael Elwell. 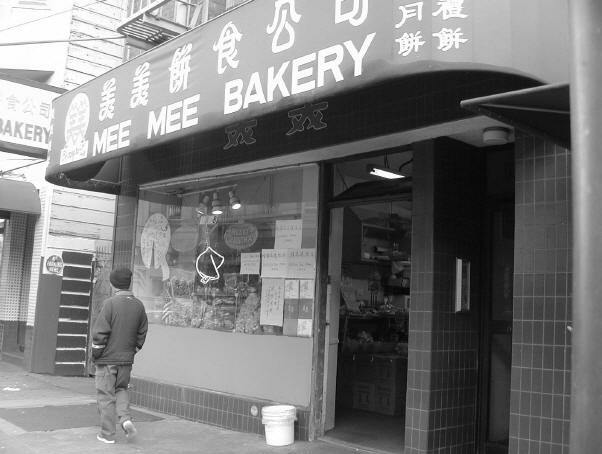 Mee Mee Bakery is located at 1328 Stockton Street in San Francisco (415 362-3204).